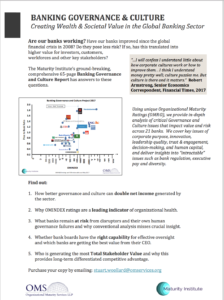 We are delighted to announce the release of our comprehensive, 65-page, 2017 global Banking Governance and Culture Report. Our Insight Series on some of the key issues arising from our analysis, including the creation of Total Stakeholder Value, can be accessed here. For more information and a free copy please contact paul.kearns@maturityinstitute.com.